Music changes when other people enter the scene, often miraculously and for the better. The same note I was playing on the guitar by myself an hour ago sounds drastically different when it combines with a drummer’s beats. The note I’m singing might sound like a different note altogether when somebody sings an unexpected harmony. Or, that note I played might gain a brand new energy when I know somebody else is listening or whispering “bravo”! Theoreticians describe the interactions of musical overtones, but mostly what I feel is the interactions of energies. Often these energies add up to much more than the sum of their parts. What’s more, they create a combined, unpredictable magic that can only be experienced once, for next time it will change. Shared music, in short, is ephemeral, a product of the here and now. Since collective ventures can go either way — for the better or the worse — we have to develop better strategies for tipping the balance in favor of a beauty that is totally focused, rather than scattered, that can truly foster communal, in-the-moment inspiration. The concepts in this post — creating a singing core, standing in the center of a small room, paying close attention to the details of other people’s singing — aim to foster focus. They may sound simple, yet they effectively remove many of the common roadblocks that arise in communal situations, paving the way for creating a shared space in which divine inspiration can potentially enter. Think about it, the most common-sense strategy for developing the kind of “singing together” I’m talking about is for singers to get physically closer. Hence, every congregation that aims to take its singing energy to the next level must develop a core group of singers who stand close together, directly surrounding the ba’al tfilah (prayer leader). I like to call this group the “Spontaneous Jewish Choir” and its participants “musical gabbaim” (prayer assistants), but this singing core is not a new idea at all. In many ways, it’s actually a return to a centuries-old shul setup where, for generations, the meshoririm (choristers) gathered around the chazzan (cantor) at a low-level bimah (platform) in the center of the room to sing spontaneous harmonies. When we stand close together, we are able feel immediate connections with other singers, to clearly hear and respond to each other’s voices in real time. What this means is that we’re not only looking for people to sing at the same time as each other, but to actually sing together in ways that allow them to respond to each other’s musical subtleties. I’ve stood in the balcony at countless large synagogues and noticed people singing four different parts of the same melody at the same time, completely oblivious to the fact that the people in the other corners were wrapped up in singing totally different sections of the melody. When people are loosely spaced around a room, they may all be singing at the same time in a literal sense, but they’re not necessarily singing together — in any emotional, or dare I say it, aesthetic, sense of the term. Who can blame them? Often they can’t even tell if they’re singing the same passage together or not; they’re just too far away to hear. What this means is that a formal piece of music, or a simple sing-song prayer, or a wordless nign — or whatever — doesn’t reach its full potential when the people vocalizing can’t hear each other’s musical subtleties. To be sure, I’ve often found myself in non-optimal music situations and survived them — and even had lots of fun. I’ve led klezmer bands stretched out across city blocks while parading through the noisy Lower East Side of Manhattan, and a marching band spaced out a hundred feet between each musician while marching 500 Jews between the dinosaurs at the museum of Natural History. But while these situations are sometimes fun for their very novelty or because they are themselves walking parties, they don’t truly facilitate musical connection. A klezmer band gets people dancing when it’s grooving close together, focused on a dance floor. A marching band rouses the crowd with a powerful wall of sound when its members are marching close together or, conversely, sitting side by side in the bleachers, rather than spaced out across the football field for dazzling visual effect. In a shul, singing must emanate from a central core of singers, who strengthen the overall singing effort. Singers sound better when they are close to the core, just as arms need the support and connection of the torso in order to function. What’s more, singing that emanates from a core also creates an atmosphere in the room — for those who aren’t yet singing — that wouldn’t occur if the musical energy were spread out, pell-mell. Many well-intentioned people think that you must disperse the good singers throughout the room, so that the singing “reaches more people.” Hence, they’ll assign Harry to sit in one corner and Morty in another, while Simcha is marooned, somewhere in the bleachers, bringing up the rear. The problem is that when people sit far apart, they can’t follow along with either the leader or each other, and eventually stop singing. They’ve lost the immediate connection with the other singers, and at best end up with a situation in which they are, indeed, singing at the same time, but not truly together. Here’s another illustration of what I’m talking about: What happens when you separate the logs of a fire? The wind easily blows them out. But when you bring the same logs close together and light the match, you can get a raging bonfire. Spread the singers throughout a huge sanctuary and what’s likely to happen? The singing energy will die down. But bring people close together in the center, and you’ll ignite a “singing bonfire” — even in a large space. At the beginning of every service, I invite anybody and everybody to surround me or the other ba’al tfilah, saying, “Please come join me here at the shtender (lectern) to sing harmonies, whether you know what you’re doing or not.” You’ll have to say this at the beginning of every service, for as many months and years as it takes for people to get the idea. Of course, ahead of time I’ve already drafted a few people to stand with me to make sure it works. I ask for at least six people, but it’s fine if the entire shul wants to stand in the middle with you! Each of these musical gabbaim are responsible not just for singing, but for paying close attention to the cues and direction of the ba’al tfilah. Now, however, let’s not forget: The main purpose of gathering this rag-tag (though sometimes amazing!) group of singers is to create communal musical energy — not to create musical perfection. So, of course, everybody is invited to participate. Our prayer service isn’t a performance, it’s a community effort, to which everybody contributes in his or her own way. It’s certainly helpful (and essential) to have people who know what they’re doing; but it can be helpful in unpredictable ways even if they don’t. As the teaching goes, the TZiBuR (public) is made up of: Tzadikim (Righteous), Beinonim (In-betweeners), Rashaim (Wicked). This inclusive vision of community applies to the musical skills of a singing public as well, and we can’t deny people their place in the musical mix. That’s right, getting close together is no guarantee of good singing. Consider for a moment the point in the service on festivals and the High-Holy Days when the kohanim go up as a group for their blessings and respond to the chazzan’s “Y’varech’cha…” with their own miraculously atonal variations. Or, I like to think of the way my grandfather, may his memory be a blessing, would wait until we had all gotten three words into Shabbat kiddush, and then proceed to start conspicuously from the beginning so that the whole thing was always off kilter (and that’s when we were sitting close around the table)! In short, at least when you’re close together, you have some chance at singing together, even if it doesn’t end up always working out. Professionalism isn’t what we’re after. We want an informal mob. An oozing cultural comfort that’ll prove a soft nest for nurturing good song. Being informal, however, doesn’t mean abandoning the quest for improvement; actually, behind this informality you’ll find yourself constantly needing to guide individuals towards participating in ways more helpful to the group-song success of the whole. For the Tone Deaf — but LOUD! — Guy, or equally the Soprano Soloist, you might praise the beauty of their voices, but suggest that in a “choir situation,” such as this, their voices could best be used if they tried “blending a little more with the surrounding voices” (translation: they ought to sing more softly). You may ask the Too-Loud-Shtender-Pounder to pound a bit later on, so that we can “build momentum” now. And as for the tone-deaf, but utterly nice fellow who just doesn’t “get” my instructions, period, there are times when I’ve changed the entire key of a song or series of melodies to match the monotone that he felt comfortable singing. Sometimes, there’s nothing you can do, and you must just laugh to yourself and think: Maybe that person is none other than Eliyahu Hanavi (Elijah the Prophet) — and who am I to say?! Often, however, the results are far more promising, with potentially amazing amateur results: great energy, communal connections and lots of active, respectful listening. I can honestly say that some of my proudest musical moments have come in the company of amateur singers who are pouring their hearts out in communal song. This post is an excerpt from ‘Building Singing Communities: A Practical Guide to Unlocking the Power of Music in Jewish Prayer.’ It has been edited for length. The illustrations are by Julie Meslin. Joey Weisenberg is a mandolinist, guitarist, singer and percussionist based in New York City, who has performed and recorded internationally with dozens of bands in a wide variety of musical styles. Joey works as the Music Director at Brooklyn’s oldest synagogue, the Kane Street Synagogue, and is the music faculty at Yeshivat Hadar, an egalitarian yeshiva in New York. 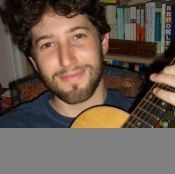 He is an artist-fellow at the 14th Street Y’s Laba program, and teaches Klezmer music as a faculty member at KlezKanada. He was recently named to “36 under 36” in The Jewish Week as one of 36 new and exciting innovators in Jewish life today. Joey visits shuls and communities around the country as a musician-in-residence, in which he teaches his popular “Spontaneous Jewish Choir” workshops. Far. Out. 🙂 I loved this…and I was also thinking it is so akin to kirtan, and possibly so many other cultural equivalents, but that's the one I have the most experience of….it's definitely in the "celestial choir" department 🙂 For me, the kind of kirtan I seek these days is an art form, a chant and response led and conducted in an artful dance…a honed and refined and subtly beautiful and deeply private and openly communal embrace of the heart and soul….I loved this, thank you Joey!